Scientists led by Dr. Bruce Archibald of Simon Fraser University have discovered three extinct species of big-headed flies that lived in what is modern North America during the early Eocene period, between 52 and 49 million years ago. 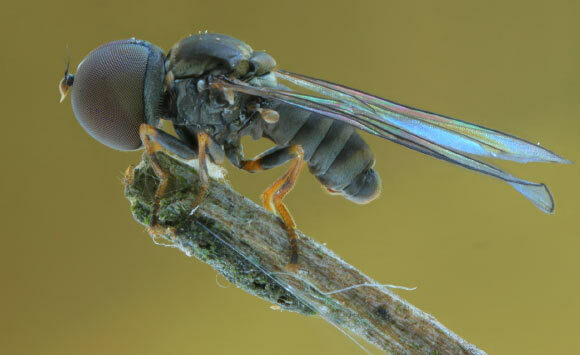 “Big-headed flies are a group of bizarre insects whose round heads are almost entirely covered by their bulging compound eyes, which they use to hunt for mainly leafhoppers and planthoppers, renowned common garden insect pests,” Dr. Archibald said. The three new species belong to the living family Pipunculidae, which includes more than 1,300 species found worldwide. “One fossil, Metanephrocerus belgardeae, is well-enough preserved to name as a new species,” Dr. Archibald said. The other two unnamed, more enigmatic species are described from less complete fossils uncovered at Quilchena in southern British Columbia. “The newly discovered species were preserved in Eocene epoch fossil beds that are 49 to 52 million years old, which is about 12 to 15 million years after the extinction of the dinosaurs. This great extinction event also disrupted forests in which the dinosaurs had lived, with mostly low diversity and greatly disrupted food webs for millions of years,” said Dr. Archibald, who is the lead author of a paper published in the Canadian Entomologist. 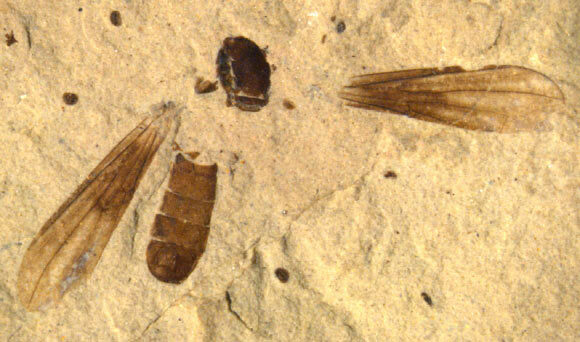 By the time of these flies in the Eocene, however, forests had diversified again, but this time with many new kinds of flowering plants that are familiar to us today, such as birches, maples, and many others. Along with these new, rich forests came an expanding diversity of pollinators and herbivorous insects, and with them, diversification of their insect predators, including these big-headed flies. 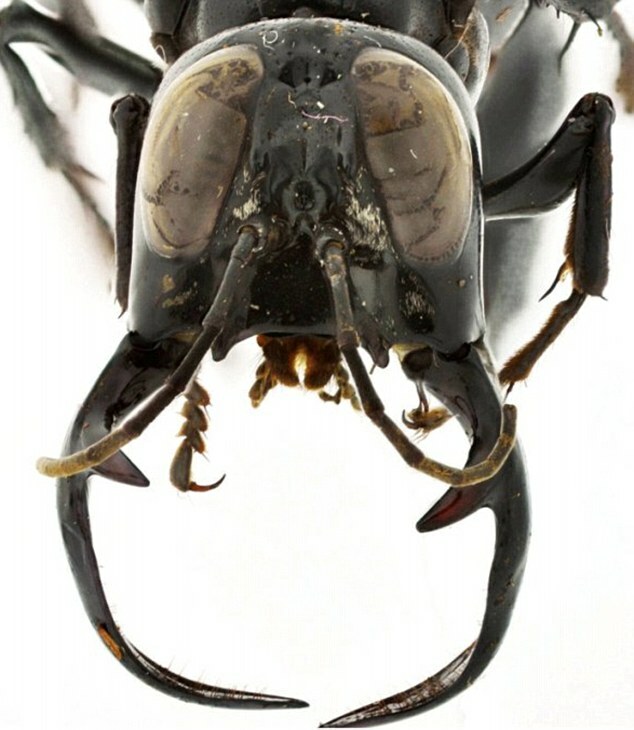 “With these new discoveries, we see that the early history of these oddly shaped insect predators provides a part of the puzzle revealing the broad ecological-evolutionary revolution of expanding predator-prey relationships and increasing biodiversity during the formation of new ecosystems,” Dr. Archibald said. The Goliath birdeater (Theraphosa blondi) is a spider belonging to the tarantula family, Theraphosidae. 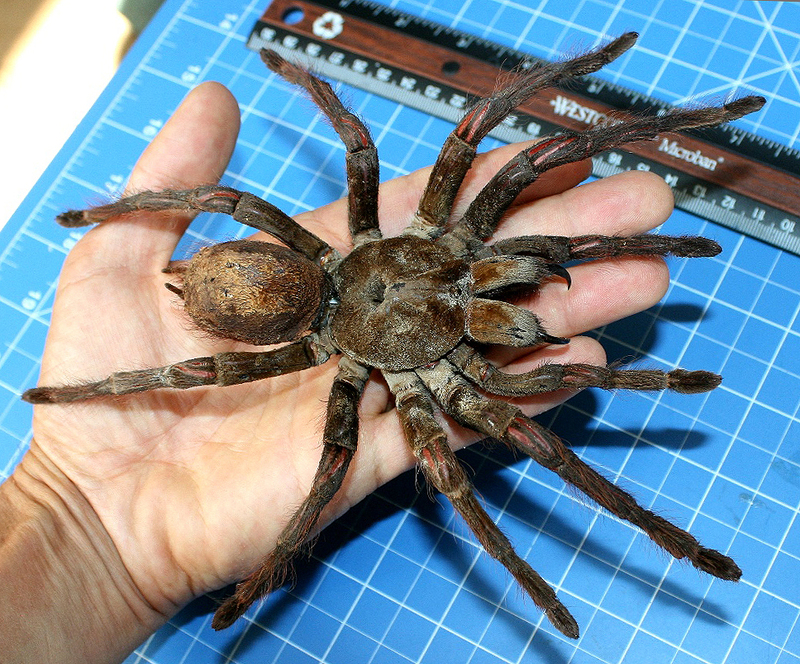 It is considered to be the second largest spider in the world (by leg-span, it is second to the giant huntsman spider), and it may be the largest by mass. It is also called the Goliath bird-eating spider; the practice of calling Theraphosids “bird-eating” derives from an early 18th-century copper engraving by Maria Sybilla Merian that shows one eating a hummingbird, but the term is inaccurate as they do not primarily prey on birds. Theraphosa blondi is native to the rain forest regions of northern South America. Wild Goliath birdeaters are a deep-burrowing species, found commonly in marshy or swampy areas, usually living in burrows that they have dug or which have been abandoned by other burrowing creatures. Females always mate and sometimes end up eating their mates. Females mature in 3 to 4 years and have an average life span of 15 to 25 years. Males die soon after maturity and have a lifespan of three to six years. Colors range from dark to light brown with faint markings on the legs. Birdeaters have hair on their bodies, abdomens, and legs. The female lays anywhere from 100 to 200 eggs, which hatch into spiderlings within two months. 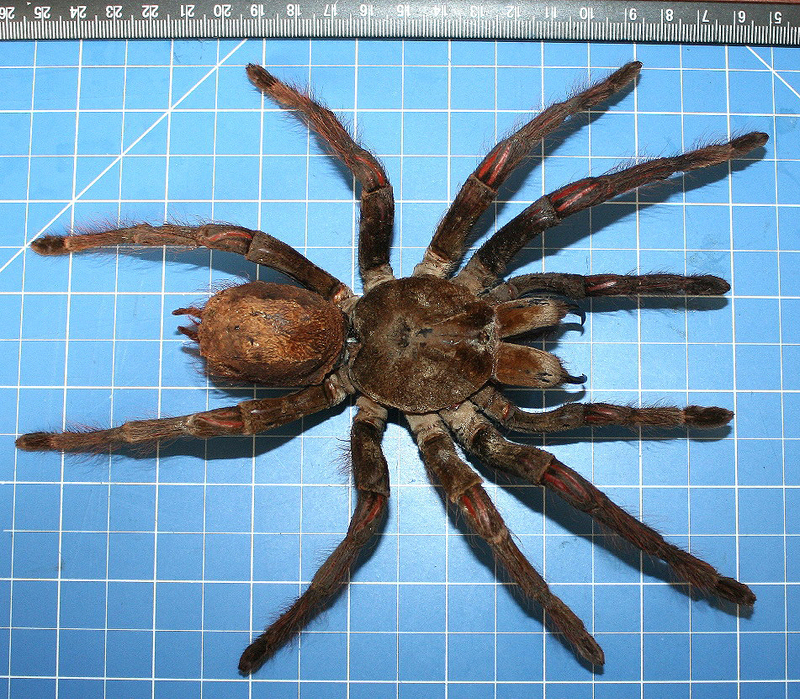 These spiders can have a leg span of up to 30 cm (12 in) and can weigh over 170 g (6.0 oz). Birdeaters are one of the few tarantula species that lack tibial spurs, located on the first pair of legs of most adult males. 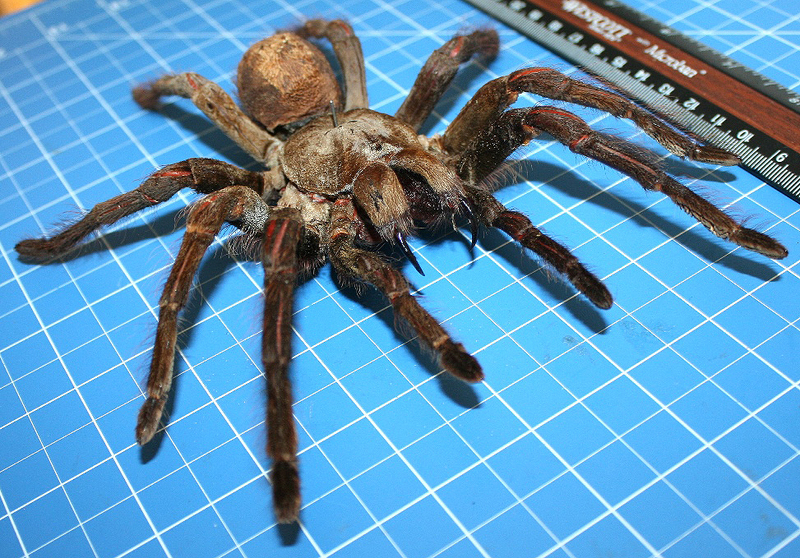 Like all tarantulas, they have fangs large enough to break the skin of a human (1.9–3.8 cm or 0.75–1.5 in). 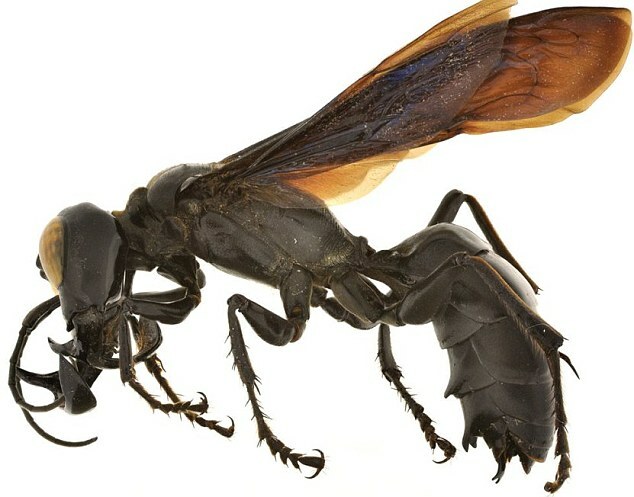 They carry venom in their fangs and have been known to bite when threatened, but the venom is relatively harmless and its effects are comparable to those of a wasp’s sting. Tarantulas generally bite humans only in self-defense, and these bites do not always result in envenomation (known as a “dry bite”). Also, when threatened, they rub their abdomen with their hind legs and release hairs that are a severe irritant to the skin and mucous membranes. 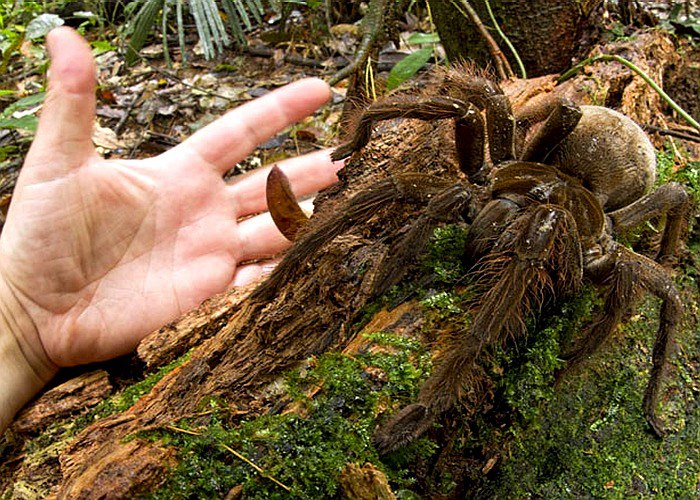 Despite its name, the Goliath birdeater does not normally eat birds. As with other tarantulas, their diet consists primarily of insects, rodents, frogs and birds. However, because of its naturally large size, it is not uncommon for this species to kill and consume a variety of vertebrates. In the wild, larger species of tarantula have been seen feeding on rodents, frogs, lizards, bats, and even venomous snakes. In captivity, the Goliath birdeater’s staple diet should consist of cockroaches (generally the Dubia cockroach, Blaptica dubia). Spiderlings and juveniles can be fed crickets or cockroaches that do not exceed the body length of the individual. Feeding of mice is discouraged because of the risk of injury to the tarantula. Fortunately for most of us this terrifying looking critter is only found on New Zealand, tough break Kiwis. 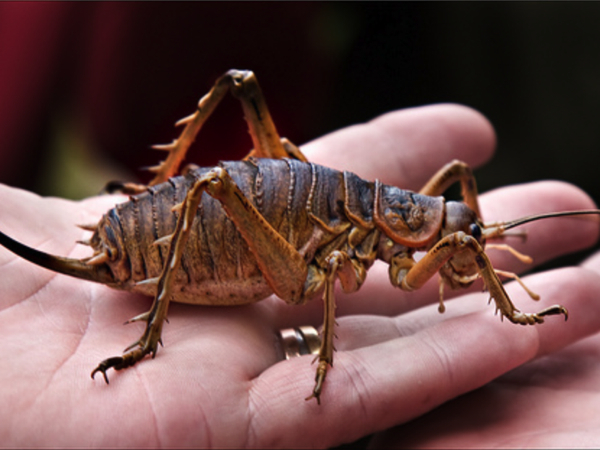 The ugly bugger is a giant weta, a kind of huge cricket or grasshopper. The giant wetas are supposed to have come about due to New Zealand’s lack of land mammals, until humans arrived there. A phenomenon known as island gigantism meant that some ugly invertebrates filled the space in the food chain by the lack of land mammals, so the wetas evolved into 50g crickets over 10cm long filling a similar role to what mice do in the rest of the world. Giant wetas are vegetarian, but they can still give you a nasty bite if they don’t like the look of you.